Collingwood, New Zealand is located at the north-west corner of the South island of New Zealand, in the Golden Bay area of the Tasman Region. It was originally a small Maori settlement called Aorere, to which the English name of Gibbstown was given. The gold boom of the mid 19th century led to a rapid rise in population and in 1857 the provincial government, anticipating substantial development in the area, had plans drawn up for a new town, to which the name of Collingwood was assigned in honour of Admiral Lord Collingwood. 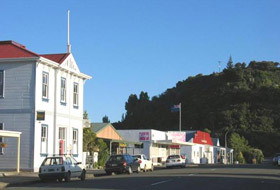 The town was even proposed as the capital of New Zealand at one stage but, in the event, the boom was short lived and this never happened. The name however, survived. Fire anyway destroyed the settlement in 1859. Another fire in 1904 destroyed the rebuilt village and as recently as 1967 fire struck again, burning down the hall, hotel and two shops. Today’s Collingwood is a mixture of old and new. Modern buildings include the general store, hotel and memorial hall, while reminders of the past are found in St. Cuthbert’s Church (1873), the courthouse (1901) and post office buildings. The crumbling grave-markers in the Old Collingwood cemetery bear testimony to a difficult past involving the fires, floods, epidemics, shipwrecks and other trials of early colonial life. 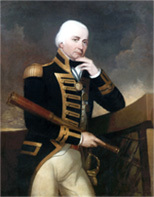 In 2005, to mark the 200th anniversary of the Battle of Trafalgar, a series of commemorative and community events were organised in Collingwood (and indeed in Nelson, some 77 miles [200 km] to the south) and it is hoped that 2010 will be marked in similar style. The Deputy Mayor of the Tasman District, Cllr. Tim King, made the long journey to Newcastle for the north-east’s March commemorations. He in fact formally represented both Collingwood and Nelson, New Zealand and also brought a gift from the Royal New Zealand Navy – a crest that has gone on display in the Tyneside RNR establishment HMS Calliope. This is particularly significant, given the actions involving the original British warship of that name in the waters of the Southern Ocean. This ‘Calypso’ class cruiser, which served with the Royal Navy from 1887 until 1951, became famous when she was the only ship to avoid being sunk or stranded in the tropical cyclone which struck Samoa in 1889. The New Zealand Naval base in Devonport, on Auckland’s north shore, is also named for Calliope Point, out of which it had been hewn by hand over three years. And coincidentally, one of the two first ships to enter it, following her brush with the cyclone, was none other than HMS Calliope.